The International AIDS Memorial Quilt of the NAMES Project of Boston was displayed in the Howard Johnson Athletic Center ice rink from Sept. 21 to 23. The quilt is made up of panels contributed in memory of people who have died of AIDS, and is a testimony to the AIDS epidemic. The NAMES Project is a non-profit, all-volunteer group based in San Francisco that organizes the display of the quilt. This was the second time that the quilt was displayed in Massachusetts. Total attendance for the weekend numbered 19,700 visitors and 500 volunteers. The total amount raised from donations and sales was $22,800. According to Phillip J. Walsh, director of campus activities, the NAMES Project first approached the Institute about displaying the quilt in the spring. After the MIT Facilities Use Committee approved the request, representatives from the MIT Museum, Physical Plant, and the offices of the president, provost and senior vice president met to put together a formal proposal to the NAMES Project. "The overwhelming response was, `Yes, let's try to get this to MIT,' " said Kathryn W. Lombardi, executive assistant to the president. "The feeling was that it is important to have the quilt here for the sake of students, faculty, and staff, as well as to do a service for the community. AIDS is one of the critical issues of our time, and dealing with these issues is what MIT is all about." MIT was chosen to host the quilt over three other institutions -- Harvard University, Boston University, and the University of Massachusetts, Boston -- which also submitted proposals to the NAMES Project. [cw-1]"We're thrilled with the site," said Julia Sawabini, a co-coordinator of the NAMES Project of Boston. "It's close to bus routes and the subway, and there's also plenty of free parking. The Johnson Athletic Center is wheelchair accessible. Both MIT and the NAMES Project are doing everything we can to ensure that as many people as possible will be able to view the quilt." MIT's contribution to the NAMES Project included the use of the Johnson Athletic Center for the display, Campus Police protection, free parking, extended MIT Food Service hours, free food for volunteers, the use of rooms in the Stratton Student Center, and a monetary contribution to help cover other costs. "Without the incredible support of the Massachusetts Institute of Technology, this display would not have happened. [MIT President Paul E. Gray '54] and his people . . . cleared every obstacle as we were preparing to put this display on," said Laurie King, another co-coordinator of the Boston NAMES Project. The Polaroid Foundation, Time to Care of WBZ-TV, Lotus Development Corp., and WBOS 92.9 FM also contributed to the project. The three-day display included an unfolding ceremony every morning, a periodic reading of names of those who had died of AIDS, and a Saturday night candlelight march sponsored by local AIDS services agencies. In addition, local AIDS groups set up educational booths. According to NAMES Project organizers, all donations made in connection with the quilt display will be placed in the NAMES Fund, which was established in 1988, when the quilt was first displayed in Massachusetts. The NAMES Fund supports direct services for people with HIV infection and their families. 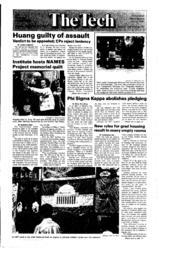 The fund's goal for 1990 is to find housing for homeless people with AIDS. Lack of housing has been identified by the Massachusetts Department of Public Health as one of the greatest problems of people with AIDS. Activities focusing on AIDS will continue at MIT through World AIDS Day on Dec. 1, Lombardi said. "We are hoping to have a series of activities that raise the awareness of AIDS, including a reading of poetry and prose written on AIDS, scheduled for Nov. 16. The medical and health department has held a series of ongoing activities, and more activities are being planned for." Among the events will be a production of the play The Inner Circle, by Imtiyaz Hussein '91. The play tells the story of a high school student who contracts AIDS. The idea for the quilt was first conceived in November 1985 by Cleve Jones, a gay rights activist, while organizing the annual candlelight march honoring Harvey Milk and George Moscone, two openly gay San Francisco politicians who were assassinated in 1978. While preparing for the 1985 march, Jones heard that 1000 San Franciscans had died of AIDS. Struck by this number, Jones asked that the names of those who had died be written down on strips of paper. At the end of the march, Jones and others stood on ladders taping these names to the wall of the Federal Building. he began to plan the AIDS Memorial Quilt. A little more than a year later, Jones contributed the first panel for the quilt, in memory of his friend Marvin Feldman. By June 1987, the NAMES Project Foundation was formally organized. Today, the quilt contains more than 12,000 individual panels and has been displayed in cities in the United States and Canada. The quilt has been shown in airports, schools, universities, drug rehabilitation clinics, and shopping malls. Since 1987, it has been shown every year in its entirety in Washington, DC. Two of the panels at the 1000-panel display this weekend were made at MIT.